The poor, battered objective case. When will its sufferings end? Even those of us who went to somewhat decent schools still missed out on a real explanation of how we’re supposed to handle pronouns in various functions within a sentence. I personally remember one lesson in eighth grade that stuck in my head, but I also followed that up with four years of Latin, which has a way of making you zero in on word function like perhaps no other language. I wasn’t a geek or anything. Most of us probably just got a slap on the wrist when we got it wrong—no actual explanation of why. That’s probably why the objective case is one of the most abused aspects of the English language, on par only with things like “their, there, they’re” mistakes in frequency. I’ve even run across, believe it or not, some fellow editors who still manage to be confused about the subject. Lookit. The objective case handles, wait for it, objects. That means objects of verbs AND prepositions. So anytime a pronoun is the object of a verb or preposition, it has to fall into the objective case. Makes sense, don’t it? Let’s figure this out logically. What part of speech is between? Preposition! So what does that make you and (first person singular pronoun)? The object—even though it’s plural. So what case should the word in the blank fall into? Objective! See, I didn’t even have to say it. Now we consult our handydandy chart. 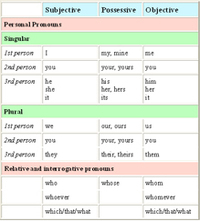 We’re looking for a first person singular pronoun in the objective case. Why not "I"? Because "I" is the subjective form of the pronoun, to be used with, wait for it, subjects. Any questions? Good. Now stop leaving me voicemails saying, "Give Suzie or I a call if you want to go to roller derby." Ith hard bein' a dog in thith town. I was juth thitting there in the corner, minding my own bithnith, when my mom comes in and 'cuses me of chewing up her favorite pair of brown shoes. Doethn't bother to invethtigate, juth startth athining blame. So much for equality under the law! I mean, I know it looked bad, but it wathn't me. It wathn't me. If Mom knew the truth about what really goes on in our howth when she's not payin' attention, she'd thcream bloody murder (kinda like she duth with she ITH payin' attention...). And I'm here to speak the truth. You might not like the truth when ith hogging the coverth and making you let it out at 3am, but thath me. I'm the truth perthonified. On the night in quethtion, a band of raccoonth snuck into the howth and thtarted ranthacking Mom's clothet. They pulled out what they mutht have believed to be the best shoes for chewin' and juth kind of went to town. Your clathic smash-and-grab job. It wathn't pretty. I mean, they were really big racooonth--what wath I suppothed to do? As a schnauzer, I'm here to tell you there wath pretty much nothin' I could do. The whole thing ith one big conthpirathy. Conthpirathy! I know how thith looks. Unfortunately for me, the raccoonth left no forensic evidence, and there ith no credible witneth to crobberate my thtory. I'm not optimithtic about my chantheth with the jury. Area cat Weasel, aka Juror #1, says she's mostly made up her mind ahead of time and planth to rethpond to the evidence prethented with plenty of snap judgements and Bible quoting. "I really don't care one way or the other, you know?" says Weasel. "I just want to get my jury service over with so I can go back to licking myself." Area cat Nubbin, aka Juror #2, was unavailable for comment but did indicate that I could go f!$& myself. And tho, the American thythem of juthtith grinds on. Thith hath been Minnifrid L. Schnauzer reporting. Arf. Next week's exposé: "Bones: what could be better?!" This was originally part of an e-mail Kim wrote me this afternoon, and I thought it had a kind of poetic rhythm to it. Can you guess who "they" are? This Tupperware thing is some serious sh%#. Recently I've been confronted with the possibility that I have my brain in too many blogs projects and that there are women out there who are far more focused than I can ever dream of being. Item! Stephanie's Tupperware representative. I'm afraid of this lady and I haven't even met her. I did some looking around on the Official Tupperware Web site and for about 15 seconds I checked on what it takes to be a peddler of the product, pieces of which my mother still owns and are older than I am. They just want to know one thing. "Are you ready to give it your all from the word go?" I gotta say I have my doubts about that one. I have no interest in giving anything my all if it cuts into my sitting around time. You know? Because those milliseconds between instances of pulling Minnie out of the litterbox and defending my underwear drawer are precious. But it got me thinking. If I was half as focused on my writing career as these Tupperware ladies are on their stuff, I might be getting somewhere. Those self-righteous motherf#%^*s.
Once again, The Onion sends my coworkers over to my cube to check that I'm not having some kind of attack...The picture they scrounged up is awesome. He looks like a hit-man. Hit man? Hitman?